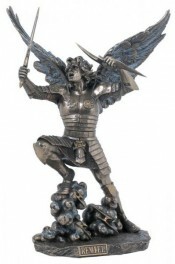 Cold cast bronze resin guardian angel warrior holding sword and lightning bolt. Ramiel Angel of Hope. Includes a collector's tag with extra info about Archangel Remiel. Michael, Gabriel, Uriel and Raphael also available in this range.